1. Fantasy football is weird, nonsensical at times, and especially in the playoffs. Variance happens. I’m stealing this idea from the great Matthew Berry, but imagine starting this borderline dream team in your fantasy playoffs: Saquon Barkley (9.6), Aaron Jones (0.8), Lamar Miller (0.8), Keenan Allen (0.0), Adam Thielen (3.9), Tyreek Hill (8.1), and Eric Ebron (1.8). That’s the No. 1 fantasy running back, two top-five wide receivers, a top-five tight end, another WR1, and two RB2s, and they would have combined to score just 25.0 total fantasy points, or 98.3 fantasy points less than their combined average. To make matters worse, maybe you even had Odell Beckham Jr., James Conner, or Melvin Gordon on your bench. Sometimes it’s better to be lucky than good. You drafted well, if it’s any constellation, but you should spend the next few weeks taking a moral inventory and begging the fantasy gods for forgiveness. I don’t know what you might have done to deserve this, but I’m sure it was terrible. You came into the week a little cocky? You talked more trash than you typically do? The fantasy gods leave no sin unpunished. 2. Fantasy football is weird, Part II. You also could have gone up against some pathetic-looking lineup that consisted of Mike Williams (36.5), Damien Williams (30.3), Derrick Henry (30.2), Ka’imi Fairbairn (19.0), and the Atlanta defense (20.0), and lost in a landslide. Those players combined for 136.0 fantasy points. Heading into the week, Mike Williams ranked just 41st at the position in fantasy points, sandwiched between Michael Crabtree and Christian Kirk. His 36.5 fantasy points in Week 15 is the 12th-most by any wide receiver this year. Heading into Week 14, Henry ranked just 38th in fantasy points, with 95.5. He has 78.0 over the last two weeks. This is the fifth-most fantasy points any running back has ever scored through the first two weeks of the fantasy playoffs (Weeks 14-15). Fairbairn’s 19 fantasy points was the fourth-most by any kicker this year. He swung leagues this week – another reason to abolish the position. Fantasy football isn’t all luck, or, I think, even mostly luck, but luck does play a key role. 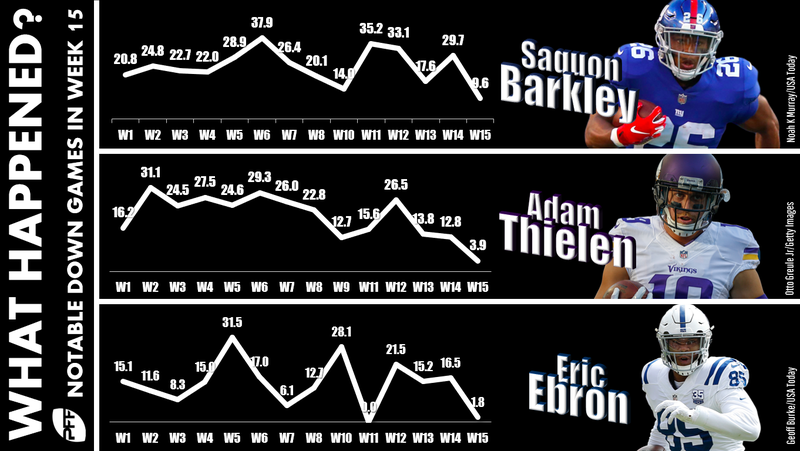 Elliott is easily seeing the best and most valuable volume of any player in fantasy football right now. 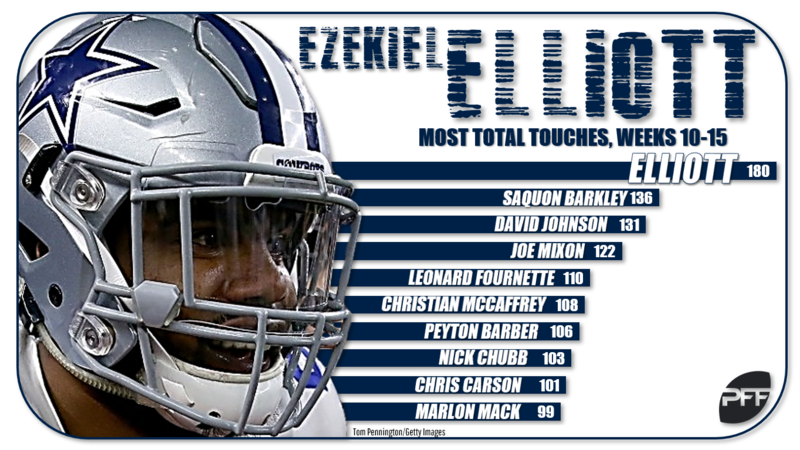 However, “touches” probably aren’t the best stat to illustrate this point. Receiving volume is a lot more valuable for fantasy than rushing volume (and especially in PPR leagues). That’s what led me to develop a metric called Weighted Opportunity. Elliott’s 137 carries and 48 targets over the last six weeks is good for a 155.8 weighted opportunity score, or the 10th-highest score since targets became a stat in 1992. If you started Elliott this week, you might be disappointed with his 17.8-point fantasy outing, but I imagine that’s his absolute floor at this point. Dallas was shut out in Week 15, after averaging 24.4 points per game since Week 6. I’d bet he’ll sit behind only Todd Gurley in my rankings this week, up against a Tampa Bay defense that ranks bottom-five in fantasy points per game allowed to opposing running backs. 4. Among all 75 qualifying running backs (min. 50 touches), Dalvin Cook leads the position in missed tackles forced per touch (0.26). 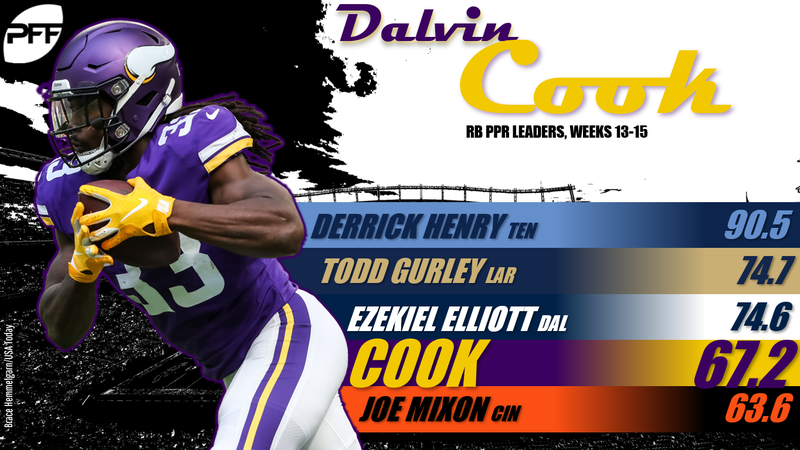 Over the last three weeks, Cook ranks behind only Derrick Henry, Ezekiel Elliott, and Todd Gurley in total fantasy points scored. Could he be a league-winner? I’m on record as being a major fan of Cook as a talent. He’s struggled with injuries ever since entering the league (as well as in college), but (finally) appears to be healthy. Over the last three weeks he averages 15.2 carries, 4.5 targets, and 22.3 fantasy points per game, while playing on 74% of the team’s snaps. So might he be a league-winner, poised for another big game next week in your championship week? I think so. Probably? The Vikings should be heavy favorites against Detroit next week, and the Lions rank bottom-12 in fantasy points per game to opposing running backs, but I’m not sure positive gamescript will be working in Cook’s advantage. He’s the preferred passing-down back and has seen better volume when the team is trailing. In Weeks 13-14 (two blowout losses), Cook played on 80% of the snaps while drawing 77% of the team’s touches. In Week 15 (a blowout victory), Cook played on only 61% of the snaps while drawing just 57% of the team’s touches. Latavius Murray’s touches came all throughout the game in Week 15 and not just at the end of the game. Murray has also seen two carries from the 10-yard line or closer over this three-week stretch, while Cook has only seen one – so Murray appears to be the team’s preferred goal-line running back. Still, I suspect I’ll be ranking Cook as a low-end RB1 this week. 5. Joe Mixon ranks first in carries (53), second in touches (60), and second in fantasy points (51.8) over the last two weeks of the season. It seems Cincinnati is rightfully putting the load on his shoulders and not backup quarterback Jeff Driskel. Even more so than Cook, I think the answer is probably a “yes,” but there is one concern (for the opposite reason of Cook). This massive workload has come in massive blowout against Oakland (Week 15) and a close game (ultimately a loss) against the Chargers (Week 14). I suspect the Bengals will be underdogs this week, on the road against Cleveland. Mixon has averaged 25.6 opportunities (carries plus targets) per game in victories, but only 18.7 opportunities per game in losses. Otherwise, the matchup looks fine on paper. Cleveland shut down Phillip Lindsay on Saturday (8.4 fantasy points), but still ranks bottom-10 in fantasy points per game allowed to opposing running backs. Mixon will be a mid- to low-end RB1 this week.